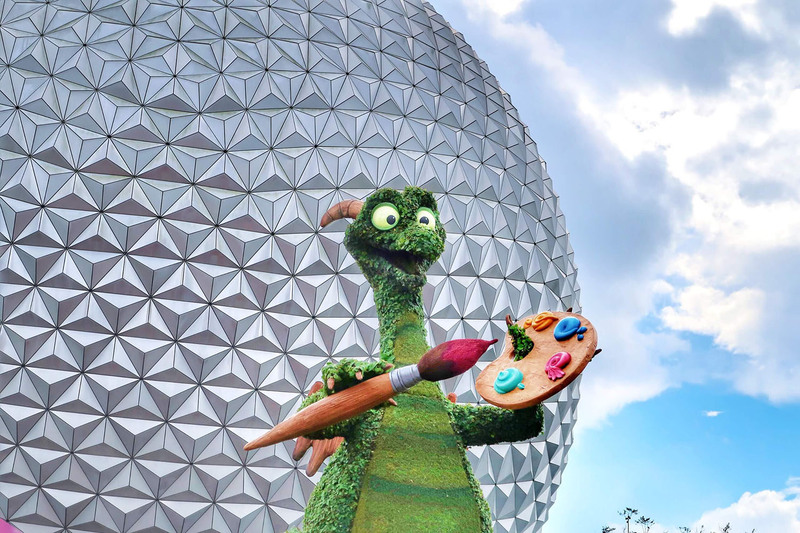 Epcot’s newest Festival is under way for its second year and if you’ve been reading my articles for a while you know how much I loved the first Festival of the Arts. Well the second year hasn’t changed my mind. This is truly my favorite of all the Epcot festivals for several reasons. Festival of the Arts has so many things that I love: Food, drinks, Broadway singers, art, artists, and of course, Disney. The fact that it’s held during slow season here at Disney World, and at a time when the weather is enjoyable to be outside just seals the deal. So, if you’re planning to go, here’s your MUST DO list so you don’t miss anything good at the Festival of the Arts! 1- Pick up a Festival Passport: This may be obvious to Disney pros, but in case you’re new to Epcot’s Festivals, all of them have a little guidebook for them. They’re free and available where the park maps are. They have everything in there; the schedules, the concerts, the food booths, everything. It’s super helpful to refer to while you’re there. 2 – Animation Academy: Long time Disney World fans will remember they used to have this as a regular thing at Hollywood Studios. One of the Disney artists draws a character step by step and you can view their work on a TV screen and follow along . You leave with a completed character drawing. It’s a lot of fun, takes about 20 minutes and is free. You’ll find it at the Odyssey Pavilion from 2:00-8:30 PM. 3 – ‘Jump-into-the-Painting’ Photo Ops: These are so fun and completely unique to the Festival of the Arts. At several locations around the World Showcase you can step inside a famous painting and reenact your own version of history. They’re included in the Disney Photo Pass package, but you can also always give the Photopass photographer your camera (or phone) to snap a picture too. They also usually include a fun little movie clip showing the famous painting and then your version with the Photopass. To find them, walk around World Showcase. Paintings are located in France, American Adventure and two in Italy. 4 – Help Paint a Mural: This was something they brought back from last year and it’s super fun. You’re assigned a color number and given a little pot of paint and sponge brush. Find your color and paint a certain number of squares. It’s really fun to watch it grow and see everyone painting it together. When you’re done you’ll be given a card showing the completed art. Located between the entrance to World Showcase and Canada. 6 – Eat (and drink!) Something Beautiful and Delicious: At Epcot’s Festival of the Arts food IS art. A concept I am very much in favor of. There are so many yummy things to eat and I haven’t tried every single item, however, here are my favorites so far. Japan: Sake in a Souvenir wooden cup with your name written in Japanese. If you like sake this is the coolest little take home souvenir and the wood enhances the flavor of the sake. Also, you can get refills. Really. I tried it and it’s true. Sake for everyone! 7 – Check out the Disney-inspired art and artists: If you are one that loves to go to Art of Disney when you visit Disney World then you will love looking at all the art at the Festival. There are so many amazing pieces and they are for sale. You can also meet some of the artists and talk to them about their work, what inspires them, how long they’ve been working with Disney, and so forth. It’s really fascinating to talk with them and watch them work. Matted prints start at around $40 with canvas and framed art at every price point. 8 – Get those Annual Passholder perks: There are two perks for Passholders. One is a free Belle artists print. You pick it up at the America Pavilion, right to the left of the American Adventure entrance. Have your Passholder card and ID to get it. The second perk is reserved seating for the Disney on Broadway concerts. In order to reserve your seating, you’ll need to pick up wristbands at The American Adventure Pavilion on a first-come, first-served basis at least one hour prior to the show that you wish to attend. Each Passholder may request a wristband for up to 3 additional Guests. You must show your annual pass and a valid photo ID to receive your wristbands. I have no idea how quick these are going to go, so if you really want to make sure and get them, you’d better show up early in the day to get your wristband. 9 – Check out the Entertainment at the Fountain Stage: There’s a rotating schedule of entertainment on the stage right by the fountain. The Living Statues are always fun, and I love to see the artists put on a show with their artwork. I’ve got the schedule of performances at the bottom of this article for you to save for reference. 10 – Take a Free Seminar: There aren’t a lot of things that are free at Disney. So when you find them, you need to pay attention. They take place twice daily in the Odyssey Festival Showplace at 1:30 and 4:30 pm. on topics like Food Styling, Better Photography, Watermelon Carving, Acrylic Painting, and many more. To see the full list check here. Optional: Book a Paid Interactive Workshop – There are also paid workshops in the same location that usually include a take home craft/art project. These are $39 and you do get an AP/DVC discount of 15% on them. They take place daily in the Odyssey Festival Showplace (same place as the free seminars and the Animation Academy) from 11:00 am – 12:15 pm. You can’t book them online, you need to call Disney to book and pay. Call (407) WDW-TOUR to reserve a spot. There’s some fun ones in this list and notice that Paige O’hara (voice of Belle) will be personally teaching her own Art workshop several days in February! Full list of Workshops here. I hope you guys like this Festival as much as I do. If you find this helpful, tag me in your social media posts! I’d love to see your visit to the Festival of the Arts.